Hello lovely readers! 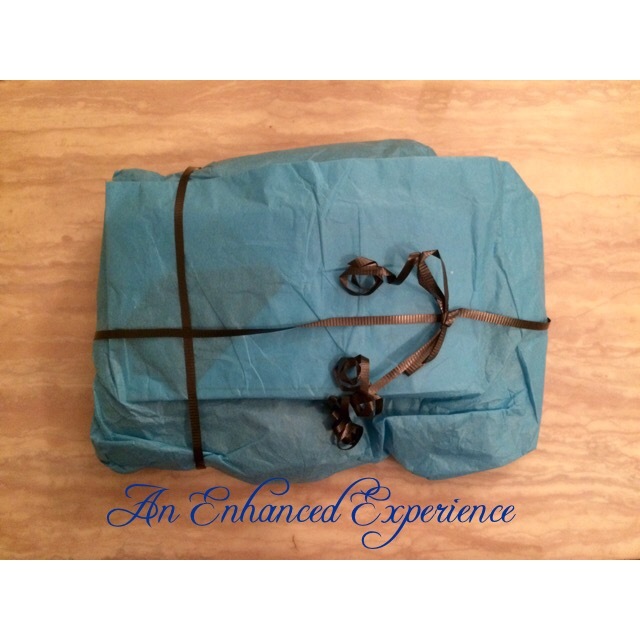 I have a new review for you today, but I wanted to start with a bit of chit chat. I’m sure that everyone seen the latest Spring offerings from Ewa Michalak. Personally, I’ve placed an order for the gorgeous Ewa Michalak Opium set in S cut. I think it will be the perfect Spring bra. I’m so in love with the poppy printed fabric and the pink trim. It is a rare thing when Ewa Michalak releases swimwear and so I’ve also ordered the new Saint Tropez bikini, although to be honest, I’m really on the fence with how I feel about those high waisted bottoms. I wish there had been options, but I still went ahead and ordered, so we shall see! Speaking of swimwear, if you are subscribed to her email updates you will have seen that Bra Obsessed will be releasing two Comexim bikinis which are exclusive to Bra Obsessed and I’ve chosen the nautical bikini. Can’t wait! When my order comes in, I’m going to drive out to Bra Obsessed to collect my goodies in person, so stay tuned for that as a future post. I’ve also recently returned from a Caribbean holiday where I put my last season’s Comexim bikinis to the test and I will report on that in another post. So lots to look forward to. I liked the idea of the bra being built right into the tank top because I often struggle with finding the right match of gym top / bra so that I don’t get bra straps etc. showing out in the open. I’m kind of fussy about that and I prefer to have my bra hidden, so this seemed like a great solution. 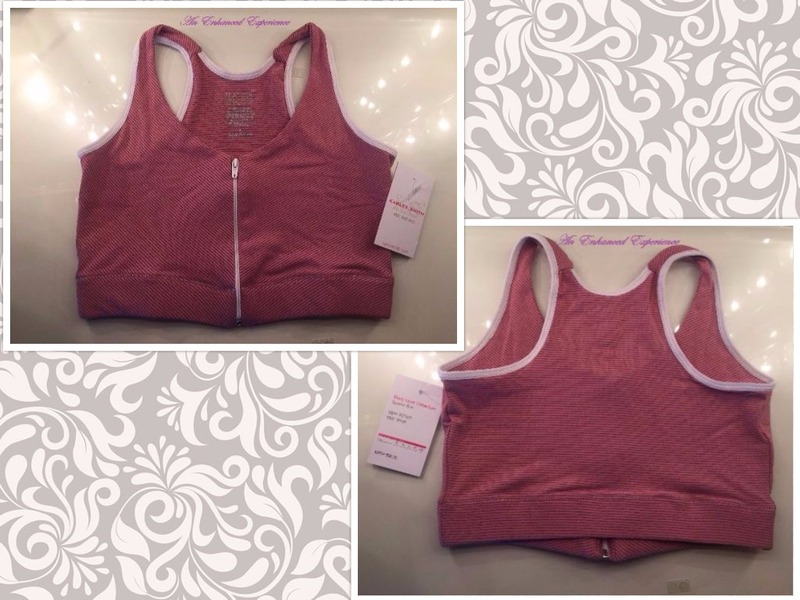 You can see in the picture below that it has a regular hook and eye bra closure. The hook and eye bra closure is completely hidden by the back of the top that sits on top of it. 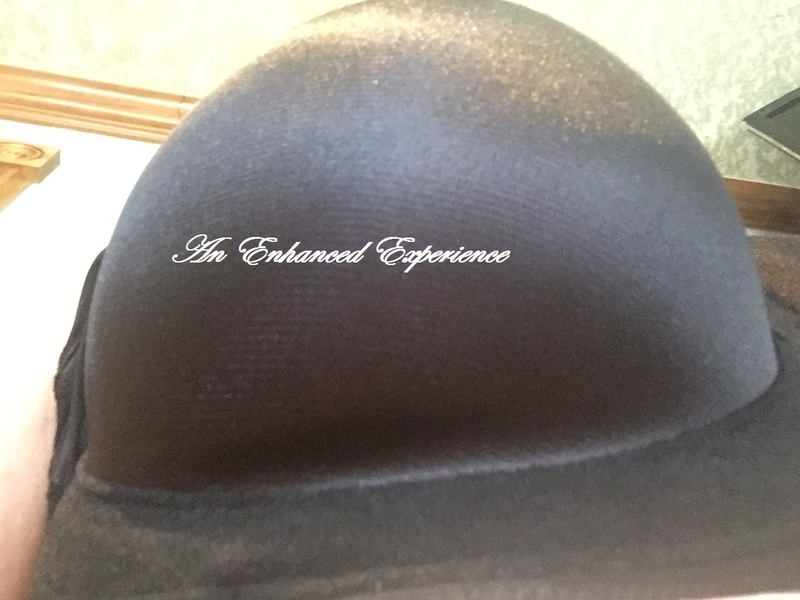 I had thought that the built-in bra was the exact same as the very popular 5021 Panache seamed model, which I own and I know it fits well, so this purchase seemed like a no-brainer. You can see how my 5021 fits me in the photo below. 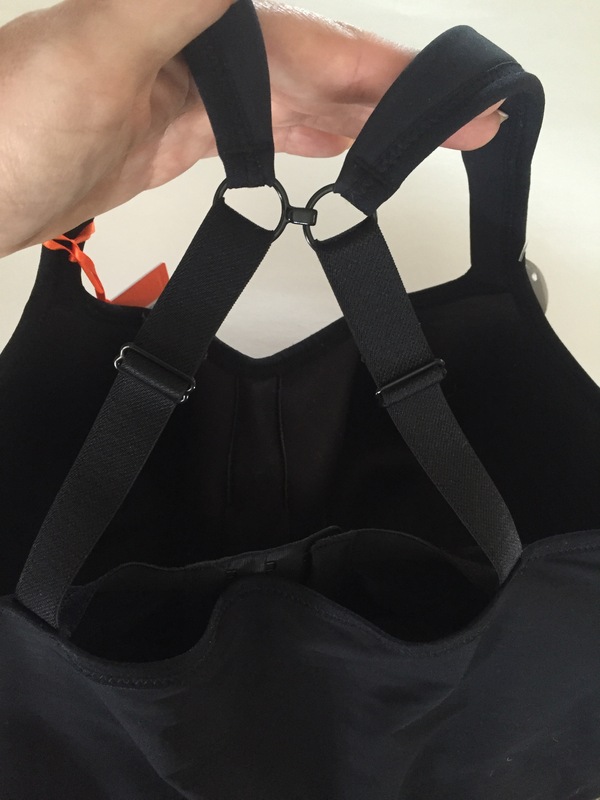 However, I was surprised to see, on closer examination, that the bra is actually a seamless bra as you can see in the photo below where I’ve put the vest on and then pulled up the vest to reveal the built-in bra. The thing I find unusual about the construction of this bra is that the cups continue long after the centre gore construction ends. In the photo below, you can see the bra inside out. In the picture below, my finger is touching the point at which the wires end. The shoulder straps contain a hook at the back, enabling you to wear the vest as a racer back, which will give some extra support and stability. It was a slight struggle to put this sport vest on and I had to do it up with the closure at the front and then carefully wiggle it around to the back. I did think that the act of putting it on constituted a workout in itself, however, in pursuit of a fair review, I continued on to the gym. 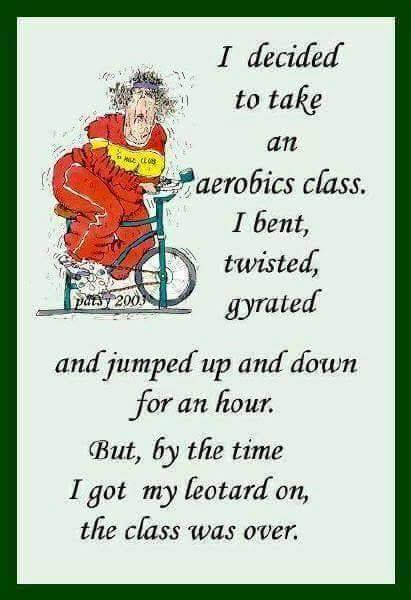 Once at the gym, I joined into a rather intense Cardio Kick-Box class, for which I lasted approximately a third of the class before I thought I was actually going to throw up or pass out or possibly both, and so, in the interests of safety and preserving what little dignity I had left, I sat out in the hall and waited for the beginner Zumba class to start. I did survive the entire 40 minute Zumba class and so I can safely tell you that the bra did its job quite well. 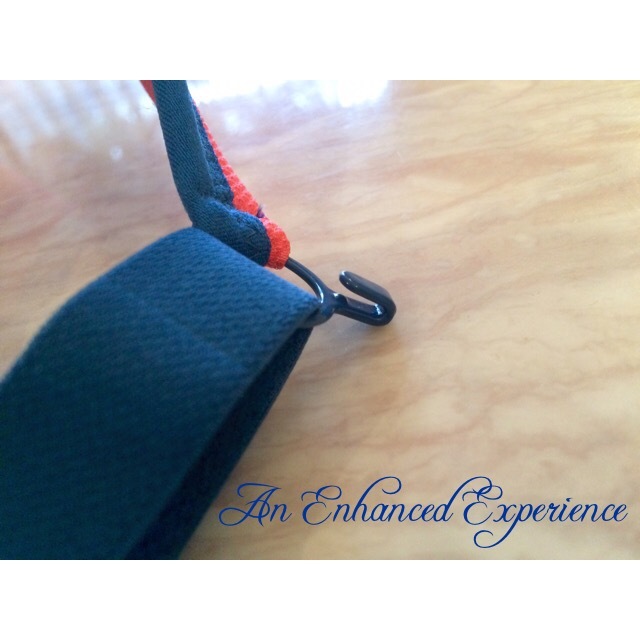 I felt as secure and bounce-free in it as I do in my Panache 5021, which is my favourite work horse gym bra. As for the outer appearance of it as a work out top, it is a clingy spandex fabric. It can accentuate tummy trouble. I felt that it had a bit of a swimsuit look to it. In fact, I’m sure it could do double duty as a tankini top if you are interested in using it for that purpose. I felt that the colourful side panels drew attention to my chest, and made me look extra boobalicious which made me feel a bit self-conscious. Because the fabric is a clingy synthetic, it did get sweat soaked quite quickly. All in all though, I thought it worked pretty well, looked fairly decent and has made a good addition to my sport bra collection. 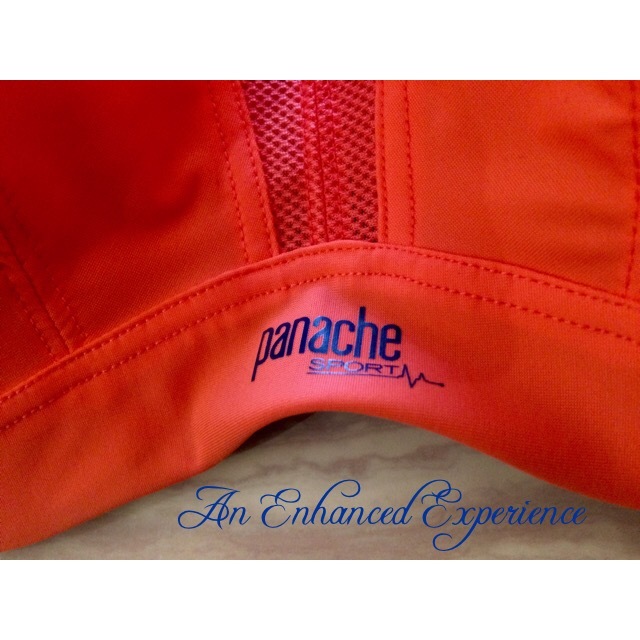 What do you think of the Panache Sports Vest? And I’d love to know what your favourite sports bra is!